Being able to travel to different countries is fun and all but I wouldn’t mind staying home. There’s a lot of reasons as to why people decide to study abroad in Europe. The main one being able to access so many countries in one semester. To be able to push a pin into the city they’ve just visited on a world map. But what a lot of people forget is to appreciate and experience their host country’s own locality. There is more to Italy than Rome, Florence, and Venice. There’s Lucca, Genoa, Verona, Siena— each different with their own specialty and traditions. Florence is a great city to travel from when visiting all of these cities. Santa Maria Novella, the main train station in Florence has hundreds of trains going in and out throughout the day. During my time here I’ve learned that there are three types of trains that Italy runs. There are regional trains that travel short distances and could be used to get to work in the city, high speed trains that travel mainly to bigger cities at well high speed, and finally there is Italo a private company that is high speed as well. Most of the trains I’ve taken to local cities are regional trains. This goes for when traveling to Pisa or Bologna to catch a flight out of their airports, or to visit nearby cities. Tickets can either be purchased online or at the station. When purchasing at the station do not forget to validate your ticket! If caught with a ticket that hasn’t been validated you will be fines and required to pay for a new ticket on the train that will cost even more. The cities in Italy are definitely worth while and I highly recommend visiting them when you get the chance! The following will be a list of the cities I’ve visited and my time there. Pisa is only about 45 minutes out of Florence. Of course everyone rushes to the park where the leaning tower of Pisa— that you can climb. But Pisa has a lot to offer. They’re a city that is lined with shops and have a great atmosphere of people on Main Street. While visiting they had their own international food fair in the center of the city. An event that my dad was happy to find. Genoa I have mixed feelings about. This was the first trip I had gone at the beginning of my semester abroad. I went with a high school friend who happen to be studying in Florence as well. We had the goal of visiting the aquarium for our birthdays that were a day apart. The aquarium, Acquario di Genova overall was a great experience with tons to see. But other than that there isn’t much to do in the city. We decided to take the 7€ city tram tour. While on the tour we had learned that Christopher Columbus was born in the city and had multiple monuments. After the tour we decided to visit the royal palace there that suspiciously resembled the palace of Versaille on a much smaller scale. The people in Genoa weren’t the friendliest of people to be quite honest. It was a bit run down as well, but other than these two things it was an experience. Lucca is a beautiful city to visit. The time we had come in the cherry blossoms had just bloomed and the streets were covered in pink petals. Our group decided to rent bikes for 4€ for 2 hours. The city is easily bikeable with access to a beautiful park , Le Mura de Luca that seems to make up most of the city. There are old fortresses that you can climb, explore, or have a picnic on. The city center plaza is shaped in an oval with its buildings built around it making an aerial picture incredible. Siena is a quaint town that has its own flare. We got in pretty late in the day, around 2PM. We took a local bus into the city center from the train station. Once getting in we quickly found a place to eat since neither of us had breakfast. The food was delicious and we continued on our way. Finding the city center’s plaza, Piazza del Compo we learned that annually they have a horse race, Palio di Siena. They run in a circular track that surrounds the center of the city center plaza. Siena also has a beautiful cathedral to visit. It’s just a short walk from the city center plaza, where local shops can be found. Best for last. 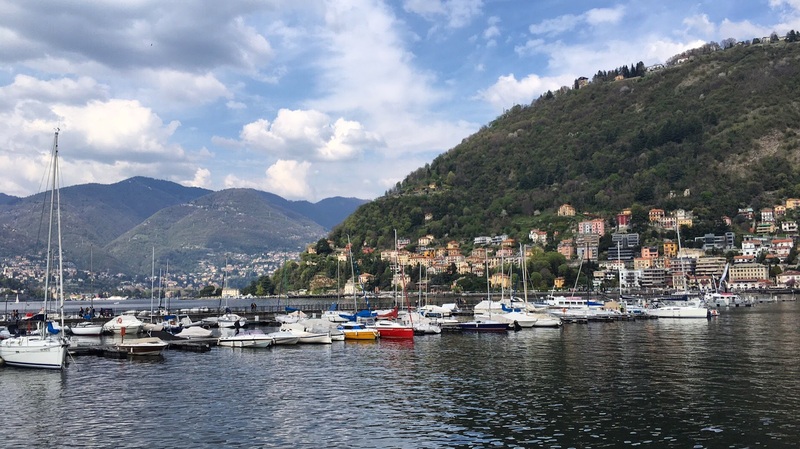 Como, a city right off the left end of Lake Como. I had taken a train from Nice, France to Milan at the end of my spring break, where I stayed for one night at a beautiful hostel, Ostello Bello Grande. After quickly checking into my hostel I caught a train to Como that was only 5€ and a 30 minute ride. The train is about a 20 minute walk to the lake and can easily be mapped out at the information booth in the station. The city had its own charm with people lounging outside smoking and drinking their mid day glass of wine. When approaching the lake the horizon opened up and was instantly lined by gorgeous mountains that stood tall. The lake’s edge had a walk way with miniature parks that people lounged and picnicked on the grass. Various docks were at either end of the walking path. The soccer stadium, Stadio Giuseppe was not too far off from the lake since you could hear the team cheering. A little further into the city were restaurants and miniature gift shops that had nautical souvenirs. There are boat tours that can be taken for 3€, except it will strictly be in Italian. Nonetheless the view made up for the information I did not learn during my ride. There’s also a cathedral, Como Cathedral (Duomo) that could be visited a short distance away from the lake. Como is a town I would love to revisit and stay at for a bit in the future. It could be said it’s the Italian version of Newport or Nantucket but of course they both belong in separate categories in terms of lake towns. Take the time to visit the underdog cities of Italy, and I’m sure you’ll have a swell time.